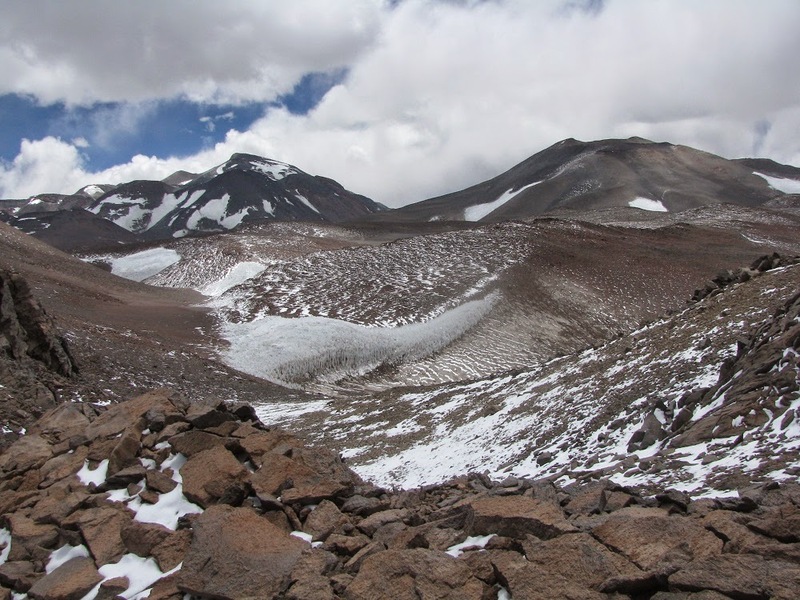 This is part 20 of a 31-part posting of my journal entries and photos from one of the greatest experiences of my life so far--a month-long mountain climbing trip to the Atacama Desert area of northern Chile and Argentina, which included summiting three 6000 meter peaks (~20,000 feet). To view all the entries in this series, check the posts labeled South America. Snowy morning at Aguas Vicunas, 16,100 feet. Will the mules return or will we be stranded? Though the temperature got down to about 15 degrees over night, I slept well and was warm once I put on a layer of insulating clothing. Without it, at first, I was slightly chilly. I got up at 7:50, just as a few others began stirring. I went to the bathroom at a distant rock, took a few photos of the bleak looking camp in the snow (see above) and chatted with others as they got up. We had a late breakfast and then were in waiting mode--two different contingencies based on whether the mules return to carry stuff further for us or not. If they didn’t come, it would be a big setback for me having to expend energy on double hauling stuff and hauling all my own stuff up to base camp. Well, it turned out for the best. 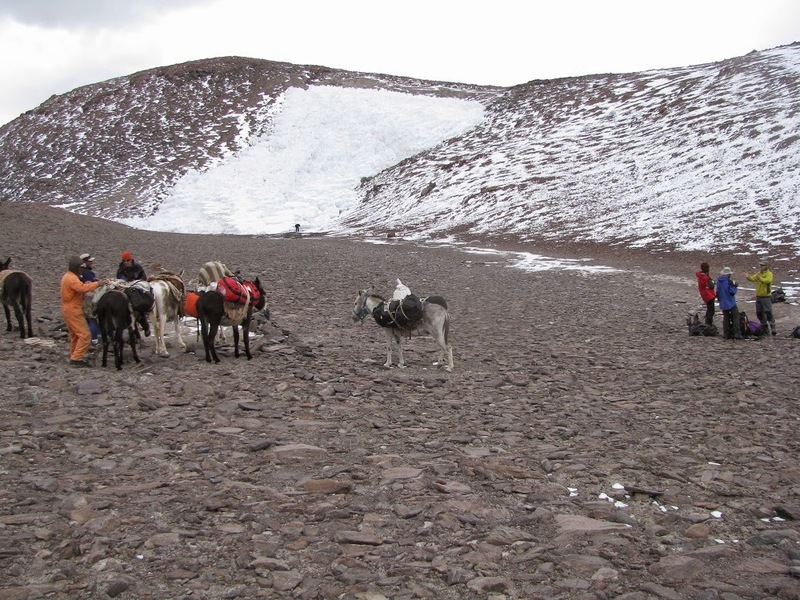 The mules arrived early - 10AM - ready to haul to base camp at 18,250 feet as planned. So we quickly got packed up. I had my plan ready and was packed quickly. One of the six clients, John Starbuck, decided not to go on. He will hike back down to Aguas Calientes and stay there on his own until we return in about six days. We set off on our final leg to base camp at 11AM and got to camp about 3:30PM. The snow was about 5 to 6 inches deep but I didn’t get shoes wet and the going wasn’t tough. In fact it was a nice change of pace from the monotonous rock and sand. We had a shorter distance today but a 2000 foot elevation change to get over a pass where we finally had a good view of Ojos and Medusa. view from the pass - high point of today's trek. Ojos del Salado is at left, Medusa to the right. Our base camp is out of view behind the bare slope and in front of the glacier below and to the left of Ojos. Neither of the high peaks had gotten any snow from last night's storm. 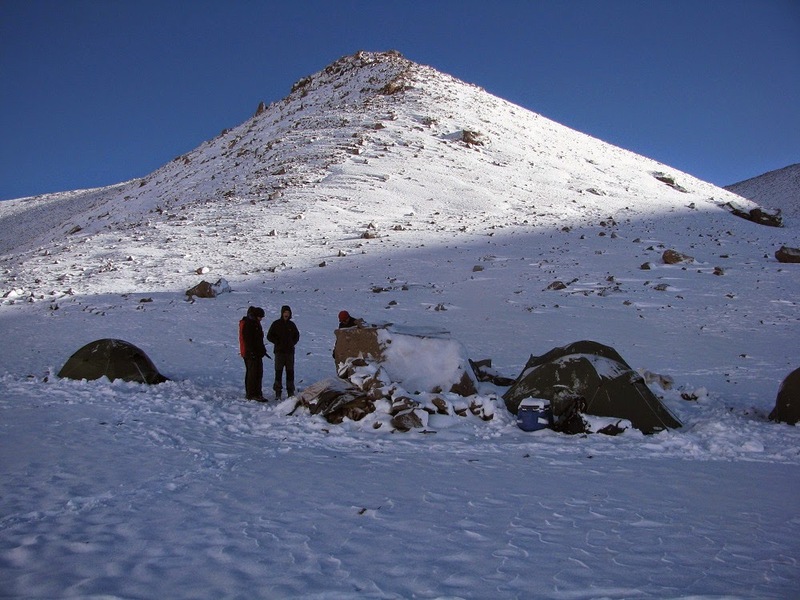 Our base camp was just a short way from the pass near a glacier that provided super clean fresh cold water. The mules arrived just after us. 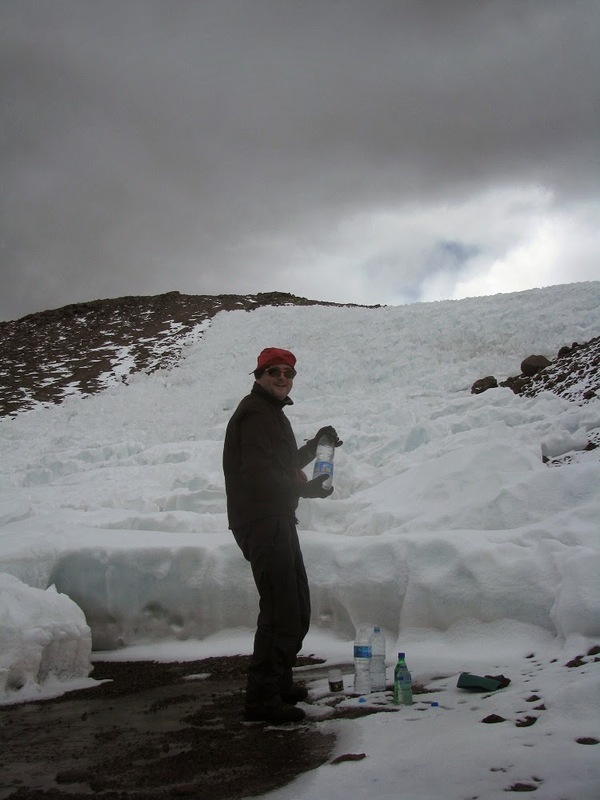 We collected water at the base of the glacier and then set up camp. The weather was deteriorating, with thunder off to the east and some spritzes of snow falling. The temperature was about 37 degrees here at 18,250 feet (522 mb pressure, which is half that at sea level) as I settled into my tent around 4:30 and caught up with my journal. My tentmate, Brian, also retreated to the tent and napped. (He had had only an hour of sleep overnight last night). Once I finished writing at 4:55 I also tucked into my sleeping bag to start to recharge some deficit of body heat (having put on all the layers of clothing I usually do). I was all warmed up by 6PM and the snow had gotten steadier by then so once again John and Damian cooked in their tent and delivered the food. The weather was actually very pleasant out - calm winds and snow and low ceiling or fog, so I stayed out for a bit, but then retreated to the tent by 7PM or so. Brian had been out too, and when he came in, we chatted for half an hour or so before settling in to bed early, at about 8PM.